When the hustle and bustle of the December holiday season is in full swing, the last thing I want to worry about is making dinner. 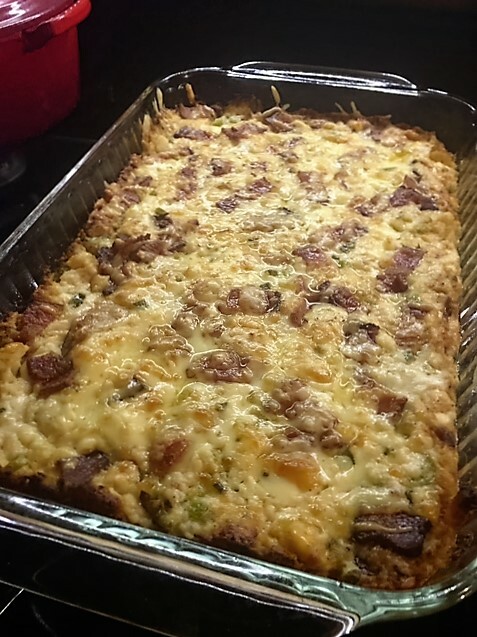 This main dish casserole can be made ahead and served with a salad for a great weeknight meal. If you don’t eat, or don’t like pork products, you can easily substitute shredded chicken (grocery store rotisserie or home prepared) for the ham and either leave the bacon out or substitute turkey bacon. Another option is to cut leftover steak or prime rib into cubes as a substitute for the ham and leave in the bacon. If you are vegetarian you can leave the meat out completely and add more bell pepper (red, yellow, orange or green). It’s a recipe that’s easy to get creative with. Preheat oven to 350 degrees. Grease a 9 x 13 Pyrex baking dish and set aside. Peel away the papery skin and cut off the top of the garlic clove. 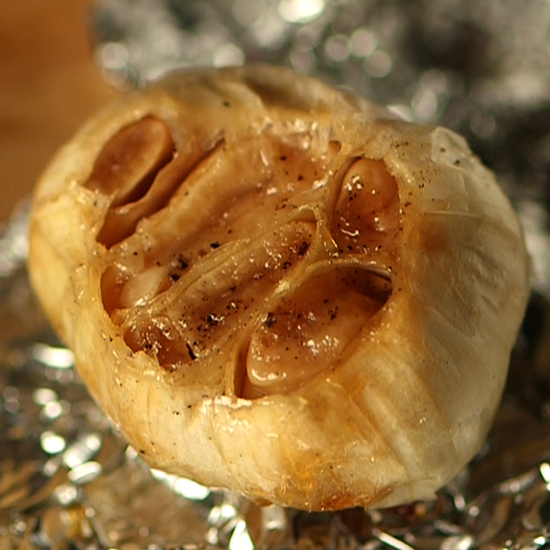 Place inside a square of foil, drizzle with olive oil, close up the foil package, and place in a shallow pan in the oven. Do the same for the shallots. Bake 30-40 minutes and remove from oven. Set aside for a few minutes then open up foil pouch to let cool. Break apart cauliflower heads, discard the stem and steam in a steamer in a large pot until tender but not mushy (about 20 minutes per head – you may have to do it in 2 batches). Transfer cauliflower to Vitamix Container or Food Processor and pulse until florets break apart but do not pulverize. Remove the cauliflower and put into a large mixing bowl. Add diced bell pepper, ham, half of the chopped green onions, and half of the crumbled bacon. Toss to combine. In heavy saucepan squeeze the roasted garlic and shallots out of their skins and add 3 TBLS butter. Cook over medium heat until butter melts. Using a fork or an immersion blender stir/blend until the garlic and shallots are crushed and well combined. Add a generous amount of pepper, the cream (or 1/2 & 1/2) and bring just to a boil. Combine the last 1 TBLS of butter (melted) with 2 TBLS of the Almond flour (all purpose if Keto isn’t a concern for you) and blend or whisk into the mixture in the pan until the mixture begins to thicken. Add the cream cheese then 1 Cup of the pepper jack and 1 Cup of the gouda, stirring constantly until melted. It may not be a flowing sauce, but resemble a big melted blob – that’s ok. Remove from heat and pour into the cauliflower mixture in a large bowl. Use a large rubber spatula to stir together until well mixed.